by his wife MarDell, daughters Lori and Bonnie, grandchildren Kendall and Raquel, and brothers Don and Chuck. great pleasure in sharing EMC design principals and practices to others. He always encouraged questions from his employees, students and customers. Chris was always willing to spend his time generously to assist anyone with a need. Chris held a BS degree in Physics from California State University at Northridge. 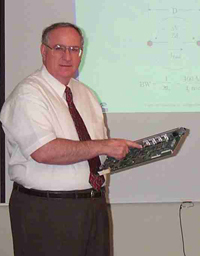 He and his wife MarDell founded CKC in 1973 to provide EMC design consultation and testing services. He was the Principal Consultant and CEO of CKC Laboratories, Inc.
Chris will be missed greatly by his family, friends, employees and colleagues. For those interested, in lieu of flowers the family would appreciate contributions to the National Mesothelioma Fund, 2401 South 31st Street, Temple TX 76508 Attn: Dr. Smythe. Checks should reference “Chris Kendall Memorial: Research Only.